When I type "recommended" into the "Search Input" in the "Header"
Then I should see "Recommended Cypress Setup" in the "Search Result" in the "Header"
When I click the "Search Result" in the "Header" containing "Recommended Cypress Setup"
Then I should be redirected to "Recommended Cypress Setup"
// That's all you need to do to stub an endpoint! When I open the "Login Page"
And I type "toli@tolicodes.com" into the "Email Field"
And I type "ilovepickles" into the "Password Field"
When I open "Some Page"
When I click "Some Element" inside "Some Container"
When I type "some text" into "Some Field"
When I drag "Some Element" above "Some Other Element"
When I take a snapshot named "Cheese"
Then I should be redirected to "the Home Page"
Then I should see 2 "Elements" containing "hello!" Then I should see an "Element" in the "Container"
Then I should see a "red" background on the "Button"
Then I should see a "blue" border on the "Button"
Why write custom regular expressions every time? "Account Select" in the "Account Modal"
Just write it in English! When I click the "Button"
When I click on the "Submit"
When I click a "Button"
When I click on "Click Me"
When I click on the "Button" in the "Footer"
When I click the "Button" inside the "Modal"
When I click into the "Modal"
When I click inside of the "Modal"
When I click the "seventh Button" in the "Modal"
And  I click the "last Button" in the "Modal"
And  I type "hello" in the "ten-thousandth Input"
Then I should see "hello" in the "ten-thousandth Output"
Easily share state in between Scenarios and Steps across files when using Cucumber/Pickle. WIP. 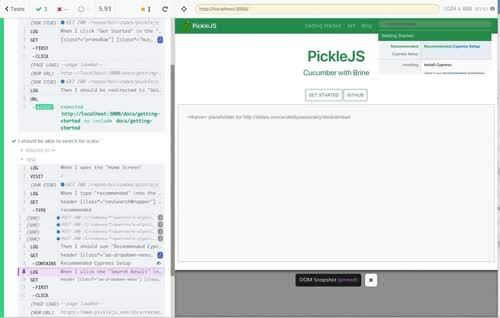 When I drag the "File" into the "Trash Can"
Then I should not see the "File"
Want to work on developing cool tools like Pickle.js?